Back at the end of 2008, the Playstation 3 got a taste of something that the PC gaming world had been enjoying since time immemorial: user generated content. Sure, Playstation gamers had seen their fair share of it in the past - titles like the RPG Maker series for the original Playstation stands among many others - but never in the full, mature way that computer gamers had come to expect. LittleBigPlanet finally brought an in-depth creation system together with the crucial ability to share those creations with the world at large. The response to the game was a resounding “Hell yes!” with reviews consistently in the 90% range and more awards than I have time to list. Sony’s “Play, Create, Share” motto had clearly resonated with the gaming public. ModNation Racers might be Vancouver-based United Front Games’ first game ever but it’s certainly fielding an all-star team with former member of EA Games, Rockstar Vancouver, and Volition Inc (makers of the Red Faction series, the Saint’s Row series, and my personal favourite Descent). Pedigree aside, ModNation Racers is a game that doesn’t just wear the “Play, Create, Share” jacket to look cool, it’s “Play, Create, Share” to the very core. The first thing you’ll notice, in both the PS3 and PSP versions, is the incredibly large selection of ‘bits’ with which you can customize your racer and his/her kart. Dozens upon dozens of ears, eyes, shirts and shoes. I’m hesitant to say the sky is the limit because I’m not even sure of that. 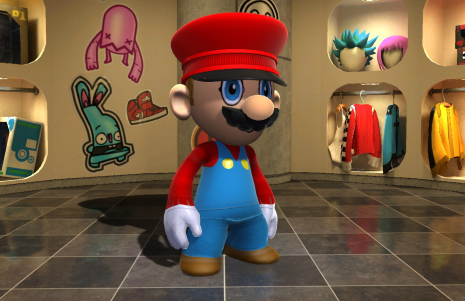 The reason you’ll be so familiar with the customization is that, even just playing through the game’s short story mode, you’ll be forced to use it (for no real reason except to show it off). While on the topic of the story mode, I’ll give one warning: if you are looking for a long and satisfying campaign, look elsewhere. While the cutscenes are somewhat amusing, the story just doesn’t work - I’m not sure it would work well in any kart racing game, but that’s another matter - and it ends up consisting of a series of races that feel disjointed from the story. It’s not helped by the fact that the racing mechanics themselves are nothing special and that the tracks are, again, satisfactory at best. However, this game is not about the story. It’s not even about gameplay or course design – not in the traditional sense, at least. 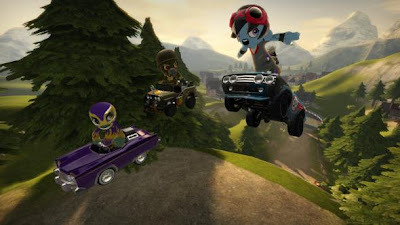 ModNation Racers is a game about creation, and that is where this game turned my opinion around. The track creator is both powerful and intuitive, allowing for easy control with you PS3 controller or PSP. A little aside here, I was blown away by the PSP version’s creation tools. I expected them to be much less powerful but they allowed for an incredible amount of control over my creations and I was able to make everything I could think of while testing it. After you’ve finished creating, it’s time for the last part of the game’s motto: Share. Both the PS3 and PSP versions allow a lot of control over uploading your creations for others to greedily lap up. Likewise, you can browse through a veritable smorgasbord of wonderful creations, be they carts, characters or courses. Nothing beats downloading doppelgangers of other famous game characters and pitting them against each other on a course of your design. It turns the game into a sort of Super Smash Brothers kart racing game. All silliness aside, both the home console and handheld versions of this game impressed me more than I had expected. However, you have to know what you’re getting yourself into: ModNation is, above all else, a game about creating and sharing. It is not a highly finessed kart racing game, but it doesn’t need to be. It’s found its own little home on this big planet (see what I did there). I scored the PSP version a little higher than the PS3 version because I feel it was more impressive given the hardware restrictions and because there are fewer titles with user generated content on the handheld market, but that’s just my opinion. Either game is worth playing, and I recommend you try them out.